Bobwhite quail is becoming a profitable business. This bird is very low in fat content and is a popular meat for many people. Due to the growing popularity of the bird as an alternative to other meats, there is profitability in raising bobwhite quail. There are expenses that will need to be paid before profits can be seen, but the ultimate profits will outweigh the expenses in the end. Buy day-old chicks. Though many quail farmers that raise bobwhite quail will breed the birds, it is a difficult process and incubation can easily fail. Starting out it is easier to buy the day-old chicks and leave the incubation process on others. Get the brooder ready beforehand. The brooder should be tested to ensure that it is at an appropriately warm temperature and that it stays at that temperature. The brooder should allow the chicks room to get out of direct heat, but also should be enclosed so that the chicks cannot get lost and will not get a draft. A draft can kill the bobwhite quail chicks, so make sure there are no possible drafts near the brooder by placing it away from windows and doors. The temperature should start at 100 degrees and move down weekly in increments of 5 degrees until the fifth week when it reaches 80 degrees. Ensure that the brooder is cleaned regularly. There should be litter placed on the bottom of the brooder which absorbs liquid and is changed regularly to avoid wet litter. Ensure that there is enough feed and water for the chicks in the brooder and that the food is placed near the heat source to avoid chilling the chicks when eating. The chicks eat game bird starter feeds, which can be found in bird stores around the country. Debeak the quail. They can turn to cannibalism when left alone and crowded. Debeaking keeps the baby quails from eating each other. 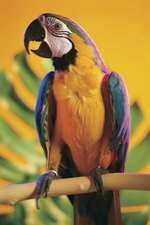 It can be done using nail clippers and cutting off one fourth of the upper beak. Be careful not to crack the beak. Allow the chicks to grow and after about 5 weeks, move the chicks to an outdoor area. This should be fenced off to keep the quail from wandering off. Sell the birds when they are large enough to be used for food. Each state has different laws about how to sell the bobwhite quails, whether licenses are needed and other information, so make sure all of the state requirements are met before selling the birds.